It isn't known who Sheyla's family are, however, she appears to have been in foster care since she was two years old. She was born blind and, due to preexisting conditions complicated past illnesses, she suffered respitory problems and was required to be placed on oxygen therapy. 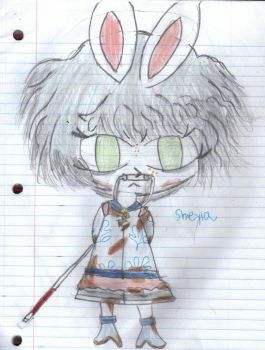 Sheyla is a girl of short stature with pale bluish-grey short wavy bobbed hair and green eyes. She is often seen covered in dirt and wearing blue boots, grey shorts, and blue jacket with a leaf pattern,n with a pink shirt underneath. She is often seen with a cane and oxygen equipment. She is generally described as determined and adventurous yet painfully stoic, save certain situations.